You do not want to miss this Historic structure!!! 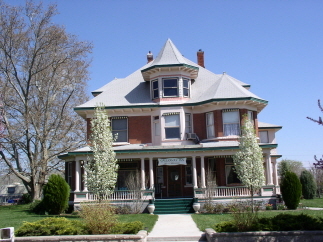 Interior Features The GALLOWAY HOUSE, Built in 1900, takes its place on the National Register of Historic Places; one of several in the Weiser area. The Queen Anne design was placed on this large parcel of land within the City limits and has been a community amenity for more than 100 years. With 6 bedrooms (2 with private baths) and 4 full baths, this historic home is well-suited for a Bed & Breakfast. Original woodwork, including many oversized pocket doors, and etched windows portray an opulence of a bygone era. Step back into history with your private tour of this perennial beauty.